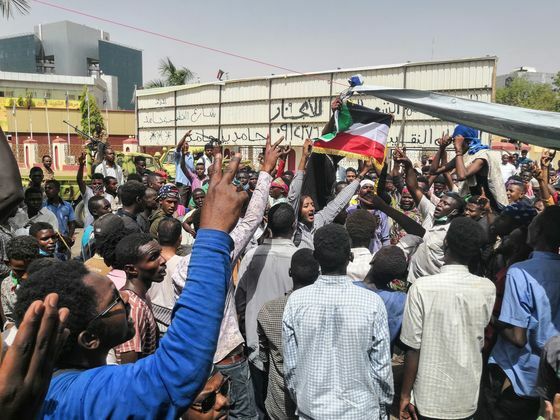 (Bloomberg) -- Sudan’s embattled ruling party vowed to organize a mass demonstration in support of President Omar al-Bashir, signaling it will make few concessions to a four-month uprising that’s seen anti-government protesters call on the army for help. The National Congress Party is urging al-Bashir’s backers to attend a so-called “million-man” rally on Thursday, acting Chairman Ahmed Haroun said at the organization’s headquarters in the capital, Khartoum. The plans come as anti-al-Bashir demonstrators maintain a five-day sit-in outside army headquarters that security forces have sporadically attacked. “We call on all our members and supporters to let the world hear their voice and to show they support the stability and security of the country,” Haroun told reporters early Wednesday. He said Sudan’s national dialogue -- long-running talks between al-Bashir and some of his political opponents -- is the only viable route to change. While al-Bashir, 75, has seen off rebellions and mass protests before, the nationwide demonstrations that erupted in mid-December over soaring living costs have become the biggest threat to his three-decade rule. More than 45 people have been killed and 2,600 arrested, according to rights groups. At least 11 people, including six members of the security forces, were killed in clashes outside the army headquarters on Tuesday, Interior Minister Hassan Ismail said. A doctors’ committee said there have been 21 deaths linked to the sit-in since it began April 6, including five soldiers. Protesters have urged the North African nation’s powerful army to support them, with observers keenly watching its actions to see which way it will lean. Military officials on Tuesday made conflicting statements about the protests, and demonstrators have said soldiers have protected them during clashes. Sudan has seen a series of coups since independence in 1956.